Lauren Meyer of Zella + Kay leaves a lasting impression when you meet her. She is lovely through and through and this is beautifully displayed through her amazing felt florals. I got to chat with Lauren about her history with The DIME Store and what it looks like to live a life you love. Let’s start out with a little bit of background: where did you grow up? Where are you living now? What does a typical day in your life look like? I grew up in College Station, Texas, and am actually living here again now! In between, I went to graduate school for two years in Tallahassee, Florida and lived in Denton for three years, as well. I work full time in Student Activities at Texas A&M, advising student leaders. I’m also a second year PhD student in a Higher Education Administration program. So a typical day looks like a combination of work + school, then I come home and use my down time to make felt florals (usually while catching up on a little Netflix). How did you become a maker? I grew up crafting a ton and actually had a few attempts at an Etsy shop through college and grad school, before Zella + Kay. In the late spring of 2016, though, I was going through a particularly rough patch and decided I wanted to try to do something creative to get out of the rut. I had always loved visiting the Denton Community Market and I decided that I’d try to set up a booth. I pulled together a lot of things I had created before, including some crocheted items, felt flowers, and signs. The felt flowers really started to take off, and it’s history from there. How did you come up with the name “Zella & Kay”? Zella + Kay comes from my two grandmothers’ middle names - Mary Zella and Patsy Kay. Both women cared for their families through creating, whether sewing, quilting, smocking, cooking, baking, or so many other things they handmade. The business name is a way of paying homage to their legacies. After I had participated in the Denton Community Market a few times, I mustered up the courage to apply to sell items in The DIME Store through the website. I had always loved visiting The DIME Store and was so impressed by all the talent represented there. A month or so went by without hearing anything and, during that time I got a new job at Texas A&M and prepared to leave Denton. I actually got the acceptance email from DIME when I was driving away! I panicked for a moment because I thought I might not be eligible to sell there because I no longer lived in Denton. Shelley was so kind, though, and let me know that they would love to have my blooms. I am so thankful for all that DIME has done for me - it was my first retailer, the first place I held a workshop, and home to some of my favorite people. What is the difference between when you started as a Maker and now? Oh gosh...so much! I was so nervous to put myself out there. The idea of being a maker seemed so appealing, but I was a little scared to launch something. Also, I was really scattered in my product line. I kind of threw up everything in the air to see what would stick. I’ve learned to hone my craft over the last three years and feel much more confident in what I’ve got to offer. I think I’ve been most inspired and encouraged by other makers. Before joining this community, I had no idea how supportive it would be. I’ve learned new methods from other felt florists (through collaborative courses), figured out how to manage my finances, cheered on others’ endeavors, and so much more. I feel really connected to makers all over the country and that has been so incredibly cool. How would you describe the DIME community to someone who has no idea what it is? I do this all the time, actually! Since I live in Bryan/College Station, people aren’t as aware of DIME. I love it so much that I tell people about it really often. In fact, Market 1023 (my home-base shop in Bryan) has curated a lot of their products from DIME makers. When I tell others about DIME, I say that it’s a collective of some really legit artists and makers in Denton, Texas. It’s a cute little shop that’s home to a really supportive community that helped me get my start as a maker. Now for some fun questions: If there was one movie that you think everyone should see at least once in their life, what movie would that be? Oh, that’s tough. My childhood favorite was The Sound of Music and it still holds a really special place in my heart. I love watching it and singing along (usually poorly!). What was the last gift you gave someone & why? I LOVE giving gifts! It’s definitely my love language, along with words of affirmation. I put together a gift for our Graduate Assistants at work for GA Appreciation Week. I collected notes from our team members, along with words they though described each of them. I created gift baskets with signs that reflected all their descriptors, to remind them that they’re all those things and more. Finally, if you could give “teenage Lauren” any advice, what would it be? I’d tell “teenage Lauren” to keep pursuing all of her varied interests and that she doesn’t have to choose between them. Growing up, I always thought that I needed to figure out my calling. I stressed so much over this. As an adult, though, I’ve cobbled together a life that I love. I’ve been able to live out my calling through so many different avenues. I can be a maker, a scholar, a marathon runner, a higher education professional, a mentor, and more. God has been so good to me through it all and His faithfulness is evident through it all. Dave & Laura have deep Denton roots and I had the honor of sitting down with them after their first visit back to Denton in three years. We talk about how they started, their long history with The DIME Store, and how they’re continuing a legacy in Cleveland, Ohio. So give me a little bit of background...how did you guys meet? What brought you to Denton? How did Triple Threat Press get started? Dave: Laura and I met in Cleveland in late 2008 and shortly after (10 years ago this week) in March 2009, Laura found out she was accepted to the University of North Texas for Grad School in Printmaking. We moved to Denton on August 1, 2009 which is the worst time to move to Texas! Laura: We ended up really loving Denton and I stayed on after graduate school. I was doing some teaching at UNT at the Print Research Institute as an assistant to the Director. I didn’t have my own way of making art on a press anymore because the university owns those presses and you have to be a student to use them. We were looking for opportunities for me to make more art and I found a letterpress on Craig’s List for $90. It was a little tabletop letterpress about the size of a large USPS Priority Mail box. Dave: There was a guy in Sanger who had posted that he was selling a press. So Laura called him and let him know we were coming to pick it up and I called everyone I knew that owned a truck so that we could actually move it and within an hour of seeing the ad, we were in Sanger picking it up. What we didn’t know was that it was non-operational. It was rusted open and it wouldn’t work at all. So we spent the entire summer disassembling it. How did you guys even know where to start in restoring the press? Laura: I helped restore four letterpresses with three of my classmates who were graduate students in 2011. The woman I ended up working for, the Director of the Print Research Institute, was our professor and we all worked together to take apart significantly larger presses. So with that knowledge I had the confidence to take the one we purchased apart. So essentially the project that we took on after I graduated wouldn’t have happened without the confidence and knowledge I acquired at UNT. And that was the beginning of Triple Threat Press? D: So we reassembled this little press and Laura was going to use it just for making art pieces. After we got it all put together and it was working, we realized we had significant money and time invested in restoring this press. So in September 2012, I thought we should try and recoup some of that, so let’s make some holiday greeting cards. L: I was applying for teaching jobs and your research as an academic artist is creating work and getting it out in the world. So you can’t stop making art just because you already have a job teaching. D: This was all pre-DIME Store when Handmade Harvest was put on by Etsy Denton. We knew we were going to be making these greeting cards but we were missing a pretty vital piece of our press which were the ink rollers. We knew we were going to get them so we designed the cards. We printed them out on an InkJet printer on our computer and we said: “Here’s what we’re planning on making, will you accept our business based on this?”. L: Shelley and Rachel (co-founder of The DIME Store) already knew us but they didn’t know it was us submitting the items under Triple Threat Press. We weren’t really telling people just yet because we didn’t know if it was going to turn into something. D: So they accepted us and then it was like “oh crap we have to make all of this stuff!”. The rollers came in and we were able to print everything and we sold at our first event in Oct 2012 and it was the Etsy Denton- Handmade Harvest. The following April is when they opened The DIME Store. L: They were our first wholesale account and had purchased cards prior to opening the store. D: They had a pop-up event during Northx35 and were trying to get the word out about opening a store. The building was completely empty but us and a few other makers all got to go do a pop-up shop in what was the original DIME Store. So that’s how we started doing this. L: Our origins are very intertwined with The DIME Store. So you guys have been around before the store even opened? D: Yeah they did that show at Shelley’s barn and we were there as shoppers. L: It was really very “we’re all artists, we all make things, we should know each other”. When we decided to pursue Triple Threat as a business was when we all kind of realized how we were all in similar states of being. D: They were really instrumental in helping us navigate all of the things that we didn’t have any idea how to do (e.g. what business documents do we need, what forms do we need to fill out, etc). They really helped us essentially start our business. Without all of that help we would’ve just been two people in a house in Denton, printing greeting cards on a little press. But because of everything they did for us we became a business; we felt like we could do it full time. You guys were here for 7 years, what marked those years in Denton? D: We split up our Denton time in two periods: The UNT Years, when Laura was in grad school and a lot of our friends were classmates and undergrad students and people associated with UNT. That ended in 2012, I was working at Mad World Records, and then the next four years were all about family-run, handmade businesses and being able to be around people that were doing things that they were passionate about. We actually chalked the design of one of our postcards onto the wall for the opening of The DIME Store! L: I started working at The DIME Store as their first employee that wasn’t an owner. It was awesome. I started as a Co-Op member and then moved into an employee. It was really nice because you figure out how things run and get up to speed and then you get to decide if this is something that you went to help out with. I always think that’s a valuable thing to learn before someone tries to give you money. D: Those last 4 years helped us, when we decided to open our store, to have all of this experience working for family-owned businesses. Now, we get to do the same thing. L: It was really nice that people trusted us to work with them and didn’t mind sharing as we went along. No one was ever cagey or anything like that. It was always from a very giving and welcoming point of view. So with your move back to Ohio, you guys have opened your own store. What are your hopes & dreams for Threefold Gifts and the Cleveland area community? D: Originally, when we talked about it we said Triple Threat would be the shop name but then we didn’t feel like that was right. We don’t make everything in the store so I didn’t want to put our business name on things. L: Triple Threat Press is the umbrella and Threefold Gifts is a DBA of Triple Threat. It was really important to us that people understand how all the makers fit together. We’re greater as a whole. I want to be able to do everything! Right now we stock on consignment but I want the option of wholesale. Capital in the first year is just really kind of volatile so it would be really nice to be able to give people the option. To grow the size of the shop so we don’t take as much of the footprint with our studio. When you walk through the front door, the shop is first, but you can see past the counter and our letterpress is right behind the counter. We don’t prioritize our goods over anyone else’s but often when people bring things up and it’s something we’ve made, we’ll say “we made this on the press right here!”. So it’s kind of nice when folks start to wrap their head around not only did we tell them that it was handmade but you can see how it was handmade. Everyone in the store is doing this. A huge priority for us is handmade professional makers. D: Another one of our hopes is that we can do a really good job of fostering the free exchange of information between makers the way The DIME Community did for us. We can be that for people who are just starting out or not really sure if they want to make this their livelihood. We can be that community of people that encourage others to do it and let them know we’re here to help you! L: We also want to be there for folks who think that making would be in their future. We might not be able to sell your stuff in the store but we have a trunk show opportunity or we’re willing to provide you contacts to folks who have similar stories so they can weigh their options. It’s very challenging to do what Makers do, so you don’t want to go into that blind. D: The store hasn’t been open that long but we’ve already been able to experience this on some level. We had a stockist who had a studio set up in another area of Cleveland and wasn’t super happy with their location and couldn’t do all the things she wanted. When one of our store neighbors moved out we contacted her and asked if she was interested. Now, she just opened her flagship store about a month ago! It was really cool to be able to have her do this thing she wanted to do and to do it right next to us. It’s another reason for people to come to that part of town, it’s another store to partner with on community events and it’s awesome. We want to do more of that! We would love for every vendor that wants to, pull their stuff out of our store because they’re moving into their own store as our neighbor. Then we can bring in other people that are just starting out and give new opportunities! Shop Triple Threat Press’ line in the store and on their website! Diana Barns is our first Co-Op member in our Maker Monday spotlight! Our Co-Op is the lifeblood of The DIME Store. They’re the artists that help us run the day-to-day of the store and who we consider part of our closest community. Diana has become a dear friend over the past year and it was a blast getting to sit down with her and chat about how her unique training was a crucial part of her becoming a Maker. So for those that don’t have the pleasure of knowing you, give us a little bit of your background? I’m (newly) 28 and I was born and raised in Denton. I went to college at Oklahoma Baptist University to play tennis. I played for the first 2 years and then my major was in Comm Design so my junior and senior years I was able to focus more on the arts department. I graduated in 2013 and then moved back to Denton and I’ve been here ever since. I really enjoy living in Denton. I think I was more excited about living here because I had been away for college. My major was in Comm Design but I took 2 ceramics courses as electives and really loved it in the beginning. After I graduated I went into graphic design for 3 years and while I was doing that, I got back into pottery on the side. I slowly built up my studio; I started with a wheel and a small kiln because it was just a hobby at the time. So what made you make the jump from it being ‘just a hobby’ to Diana Barns Pottery? I started doing it more and more as a hobby and the more I realized how much I loved it, I started thinking in the back of my mind “this would be really cool it I could focus on this more’. But you can only do so much while working full time. Originally, I had never really planned on switching over to pottery completely but after my 3rd year of graphic design I was realizing that I didn’t really want to sit at a desk all day every day. I still wanted to do something creative. I’ve learned a lot from graphic design but as I was thinking that it might not be what I wanted to do long term, I started thinking about pottery more. I initially thought about going back to school and then I found the apprenticeship in England so that’s when I made the jump. If it wasn’t for that opportunity I probably wouldn’t have fully gone for it. How did you find the apprenticeship in England? I was bored at work one day and I started googling pottery apprenticeships and I started finding that this type of training was more common in Europe. So I thought that would be really cool instead of going back to school, going to another country to experience a different culture and live somewhere else while I learn the skill better. It was definitely going out on a limb. I had emailed a few people not really expecting a response but after I got a few replies I started really thinking of it as a possibility. Penny, the lady I ended up working for, she emailed me and said she was looking for someone and the timeline just really worked out to where I could finish up my job and then move out there. I had a few months to decide if I was going to quit my job and move so that was an interesting couple of months while I tried to make that decision but I’m really glad I did it. How long were you there? What did that apprenticeship look like? I was there for 6 months, February to August, and I was definitely nervous at first. I had skyped with her once and emailed a few times and knew that she had a small studio in a tiny little village of about 1000 people. It was very countryside, small town which I really liked the idea of. But I was nervous because I had never lived overseas. The apprenticeship itself was really great. I learned a ton! The first month or so was a lot of repetition, just practicing to get to where I could get the forms good enough to make stuff for her. A lot of training by trial and error; she would show me how to do something and then I would spend the day practicing it. There was definitely a big learning curve from the very beginning to the end, it was basically 9am-5pm or 6pm in the studio every day and she would give me something to make and slowly but surely she would keep more of what I made. So I would make her forms and then she would do the decorating and I would help with small tasks, like an assistant. It looked different the longer I was there and the more she trusted me. It was definitely a hands-on, studio-based apprenticeship and I thought it was a good way to learn. So how did the end of the apprenticeship compare to the beginning? The beginning was about learning the ropes and how the studio was run. At that time I had only taken a couple of ceramics classes so there was a lot of skill I still needed to learn. Because of that there were a lot of frustrating days in the beginning. I would spend an entire day working on something and we wouldn’t keep any of it. But i think that was also a really good way to learn because there wasn’t the pressure to keep everything you made. Looking back now, as a maker, if you have to toss out a whole batch of something, that’s what you’re trying to make a living off of but as an apprentice you have the freedom to experiment and practice without that pressure. It was really important to learn to not be too attached to what you make because you definitely progress and get better and then look back and see how what you were doing at the beginning wasn’t very good. So from the beginning to the end of the 6 months you could definitely tell that there was improvement in my work. Penny was also very encouraging about my progress but it was also mentally tough to be working in the studio every day for someone. There is a level of pressure and expectation because you are working for someone else but it provided a really solid foundation to leave there and branch out on my own. Being in the town itself, moving somewhere where you don’t know anybody, and getting involved in the community and seeing how that even changed over the months was really cool to see. There were actually a lot highly skilled potters in that area that I got to meet and visit different studios and be really inspired. What was the timeline between coming back from England and becoming a full-time maker? It took me a couple of months to get my studio running. I already had a wheel and a kiln so I was partially set up but not for a full studio so there was definitely some things I needed to do. I did a couple of shows in the fall after I got back and then in the spring is when I remodeled my garage to be a fully-functioning ceramics studio. It was a progression but I got to it really quickly. Can you talk about what it’s been like to be in Co-Op? How did that come about? What benefits have you found? I’ve been on co-op for about a year and it’s definitely been one of the highlights of the past year. Shelley originally approached me last year but even before I got back to Texas from England she was someone who encouraged me to jump right in. She was already such an encouraging voice throughout the process and so I was really excited to be a part of the community and be more involved in the store. It’s a big jump from working a 9-5 job to being self employed and working by yourself. Having the Co-op as part of my community has really helped in that transition. Looking back at the past year, those are some of my good friends now! It’s just fun to part of it. The Dime Store community is a unique community in the sense that everybody is very open and encouraging with their ideas and feedback. It’s really nice to have different sounding boards to share ideas because working by yourself and thinking through things by yourself can only go so far sometimes. The DIME Store is just a very encouraging environment and as a Maker I think there’s different seasons everyone goes through from motivated to kind of stuck to working on new things or more being established. I think all of us are at different places at different times so it’s great to have each other to encourage one another wherever you’re at and not feel crazy or the only one feeling a certain way. So growing up here and now living as an adult, how is Denton different for you? Denton has grown a lot even since I graduated high school and came back from college. There’s definitely more to do and it’s turned more into an arts community, I guess it’s always been an arts community but I feel like there’s more of a focus on that now. Maybe that’s just because I’m a Maker that I notice it but there’s definitely more to do than there used to be. There wasn’t anything on the square that you would really want to go do and you’d have to get out of Denton to do anything really fun so it’s nice to stay in Denton and have all of these great options. If there was one movie that you think everyone should see at least once in their life, what movie would that be? I feel like these questions are harder than the serious questions...there’s so many good movies! My go to’s are the Harry Potter movies. If you haven’t seen Harry Potter then who are you?! If you didn’t have to sleep what would you spend your time doing? Well I really like sleep! But before I was a potter I would probably add more hobbies but it’s a little different now because I do my hobby as a profession. I would probably watch more Netflix and movies and definitely have a more balanced life. I’d do the things that I feel like I don’t have the time to do like house projects! I like working on house stuff but I don’t do it as much because I don’t really have the time for it. Find Diana’s work on her website and at The DIME Store! You can also find our exclusive blue-rimmed Denton mug from her here! Kat French is a breath of fresh air. This week, I sat down with her in her Flower Mound home over a cup of coffee & a Ravelin chocolate croissant and we talked all things creative! As a mom, wife, friend, creative, maker, and so much more, Kat opened up about her journey over the past few years of her paper goods business and shared about struggle, time management, and what inspires her. So tell me a little about your road to becoming a maker? I actually went to school and studied an entirely different field, Child Development & Psychology, and I worked for a couple of years in that. Before going into the the work field I did Missions for a year and fell in love with drawing. I had drawn when I was little, my mom is an artist, but I just fell in love with it on a different level. I started working in the field that I had gone to school for and it was the worst place ever for me. It was such a bad fit and so about a year into that I started a Design program at our local junior college and fell in love with graphic design. So after working full-time and doing school full-time for a while I was able to get a job in-house at a church in California doing graphic design and video production. After we moved out to Texas a couple of years later, I set up and did freelance design for about 5 or 6 years. After we had our son, I began working around his naps but he kind of started to phase out of those so my time just started getting shorter and turning around projects for clients was becoming too much. So then I was just ready to design for myself and to make stuff that I could make a product from and make multiples and only have to design once, since my time was so limited. I branched out into Etsy and switched out of freelance design and it took me about a year to figure out that i wanted to do cards, specifically. It was all really slow with lots of baby steps and I kind of ended up in it. I never thought I’d be a greeting card designer but in hindsight it makes total sense. It seems like it was meant to be but I just couldn’t see it. Where did you find that outside influence and support during those formative years? Definitely my family and my husband. Especially when I was working full-time and doing school, I was really encouraged by my mom. She really gave me the courage to do it. Once I got into card designing I have a couple of really good friends who were really supportive. They would give me lots of feedback, come over and fold hundreds of cards for me, and drop everything to come do shows with me! As far as the business side of Kate French Design, you aren’t formally trained or educated in that side of things. How have you navigated that? It’s a lot of trial and error. I love administrative stuff and am pretty organized. If you look at my business it’s 60% business administration and about 40% creative design so since I’m kind of wired that way, that’s a really good balance for me. On top of that, connecting with local makers, like through Etsy Dallas has been really good. I also did the TSBC course specifically for card makers and learned so much about wholesale and the industry and that’s been a really strong community as well. From everything! I have a list on my phone and I write down concepts all the time. A lot of my cards are humor-based and a lot of comedy is just observational comedy. I kind of find myself pursuing a role of comedian and it sounds weird and slightly skewed in a way but just a lot of observational stuff. I was recently in a conversation, talking about how as artists, you aren’t necessarily inspired by people doing the same thing you are, that can lend itself to comparison or even duplicating what they’ve already created, you’re most inspired by things that are outside of what you’re creating...do you find this to be true for you? Yes! Very much so. In fact, I will come up with an idea and google it to make sure it’s not already out there. Because if it is, I’ll either have to approach it from a different direction or toss it completely. I want to be original but I also don’t want to tread on some else’s work. Yeah. More so when I was an in house designer but yeah it’s frustrating. Man. What does that feel like? What does that stir up in you as an artist? There’s a little bit of flattery, to be honest. But it irks you when you see someone else getting what you were hoping to get from it. Aside from whatever it is you’re trying to communicate, it is a business and I’m trying to make a living doing it and if someone else is going to take my work and cut into that, it’s frustrating. That makes total sense. Especially because you have a family and a home, etc. So how do you balance being a creative, being a maker, a mom, a wife, and whatever other roles you play? It feels different every day. It’s a tug of war. I’ve always wanted to be home with my kids and I’m getting to do that but then there’s days where I just want to work and I feel really pulled between them. There are days where I’m sitting with my daughter and I’d rather be upstairs designing something and that’s hard. It can sometimes almost feel like a prison some days. That’s crazy to say, but that’s when I have to step back and say “dude I’m getting to do everything I wanted to do” but it’s not always on my schedule so I’m really just figuring it out. How would you encourage other makers who are in your same season of life? One aspect is just take inventory of what you’ve got and the things you’re juggling. Step back and be thankful that you have all of those things to juggle. The other thing is if you’re good at making lists, make them! Knock them out and try and be as efficient as you can. Try not to have those distractions when you get those chances to work. And try and make sure your spouse is engaged with what you’re doing and they understand the value of it. Making sure they’re on the same page as you, communication being the real key. So much great advice. I’m gonna end our time together with some fun questions: What are some of the top TV shows that have come out in the past few years that you are in to? Right now I’m really into Heartland, it’s not new at all but i’m super into it. My husband and I have been watching Marvelous Mrs. Maisel, and we got really into GLOW, Kim’s Convenience, & Schitt’s Creek. And last, but not least, if you’re visiting Denton, what are some of your favorite places to go? So I always go to The DIME Store, I love going to SCRAP and buying all the things. The kids also really love The Chairy Orchard. You can find Kat’s line at The DIME Store and on her website by clicking here! Welcome to our newest tradition, Maker Monday! We believe in bridging the gap between our customer and the maker -- and this new project is a great way to learn about the person behind the product! 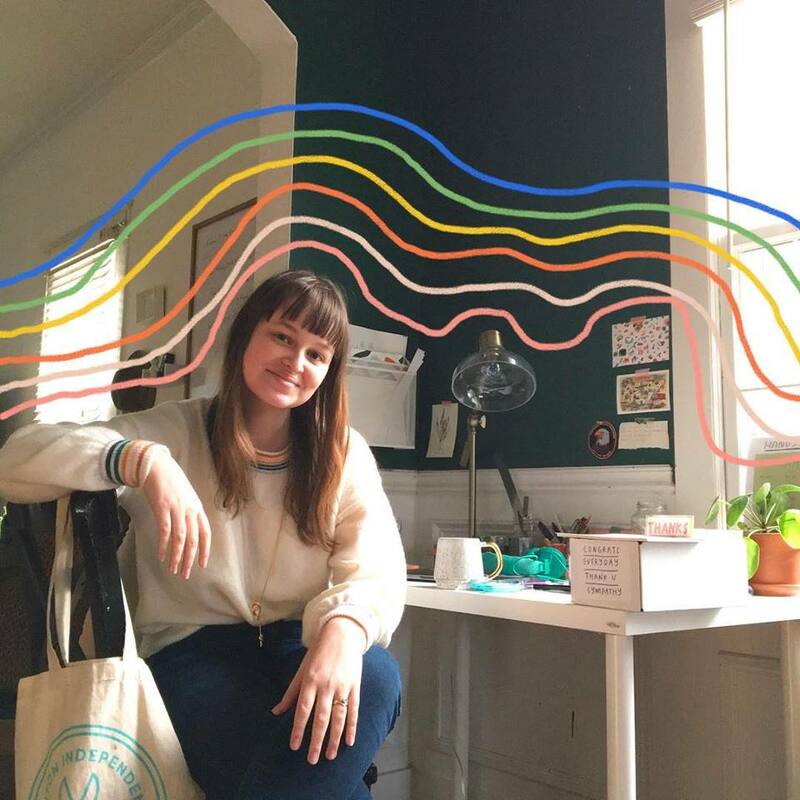 This week our Store Manager/Purveyor of Hopes & Dreams, Marissa, chatted with Katelyn Hanf from TetraKate. Kate is one of the newest makers at The DIME Store and we spent some time getting to know her a little better! So Kate, where are you from? Give me some of your best stats. I’m 26 and I grew up in Mckinney but I’m originally from Ohio. I transferred to UNT and lived in Denton for 4 years. I got a job right out of college and now I work in Allen and live in Dallas. I come back and forth and spend most of my time between the 3 cities. Well I work 3 miles away from the house I grew up in and lived there for 20 years so I was ready to move on. I’ve been in the same job I got straight out of college - I actually started in my last semester during finals! Wow! I can’t even imagine how crazy that transition was. So what exactly are you doing now? I’m a site manager which means I manage the storefront of websites. I typically have big clients that own multiple websites. I’m learning how to use several different and all the different aspects of running ecommerce. I came to UNT with the intention of majoring in Advertising but I switched to Merchandising and fell in love with digital retailing. How/when did you start making? I was always in art clubs or DIY projects but I could never find anything I really loved but I was out of college with a lot of free time and doing some experimentation. I knew one girl that was selling on Etsy and doing really well so I thought “I have time” and I really want to do something with my hands. I happened to have a bunch of clay so I just started making jewelry for myself and friends. 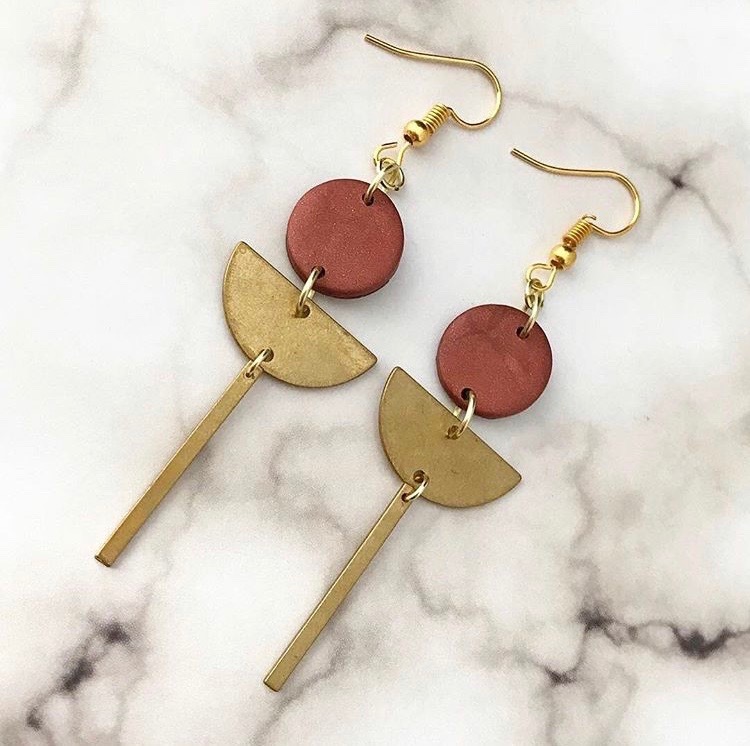 I would wear some big statement earrings and I would get compliments and people asking if they could order some; I didn’t really plan for it, it all just kind of happened, so I opened my shop in March 2017. Where did the name Tetrakate come from? I came up with the name a long time before the shop. I was really into pattern drawing and lots of geometric drawings on graph paper. I had hoped to one day make an Instagram account for those drawings and I thought about a name and came up with TetraKate. Kate, obviously for my own name and Tetra is a reference to geometry, specifically the tetrahedron which is the most stable of the 3D shapes. I thought the biggest thing I’d ever do was get them printed on notebooks, I did not expect it to be making jewelry! Tell me a little about your history with Denton...you went to school here but what brings you back? Yes, I graduated in May 2016. I have such a good network. I still do several markets there (The Backyard Market at East Side, Studio E, etc.) and one of my best friends is an artist in Denton so I try and come out and support her whenever I have a free night. How has Denton changed since you lived here? There are so many more places for community to go! Now, with all of the stores and bars opening there is more of a variety. There are also more sub-communities coming up and maybe I didn’t know about them when I was there but I have definitely seen the community getting bigger over the past year. How do you balance the full-time gig and making? It’s really really hard. A lot of the time I get really inspired at work but I can’t do anything about it. I don’t get to choose when I work on that. When I get home, I’m tired! You have to be really committed to it. If I have a big event I have to hole up at home and get things ready but when it’s not crazy busy I can be more flexible. I really try and build my schedule around that. Has there ever been a temptation to give one up? Never for long enough for me to go through with it. I have those thoughts but then I go to the event and get feedback and start talking to people, it makes it really worth it. In order to do both you really have to know yourself and be a self-motivator. As an established maker, how would you encourage others in this same position? Well thanks for calling me established! I definitely don’t feel like it all the time. You have to be really honest with yourself. If you want the freedom to come home and do whatever you want, whenever you want, this isn’t for you. There will have to be sacrifice but if you choose something you really care about, it’s worth it. There are days where I really don’t want to work on this but if I didn’t love it I would’ve ended it a long time ago. You have to be all in! And expect It to be a time requirement! That’s really great advice. So time for a fun question: If you didn’t need sleep, what would you spend those hours doing? I would take time more for myself! I would workout a lot more. I’ll take any time I can get to work on that! I would also work on TetraKate as much as I could. Last question, because Denton loves Denton, what are some of your favorite places and things to order in Denton?? Eastside - moscow mule, West Oak - latte, DIME - I like looking at all the stuff, it’s really inspiring, Barley & Board - I’ve tried so many things on their brunch menu and it is ALL GOOD! Book Scout + DIME = Family Fun Wassail Storytime & Pop up! Earlier this fall I ran into Lauren Vanderpool at an outdoor market where she was introducing her brand new business called Book Scout, an independent pop-up shop of custom children’s books. I've known Lauren for many years and have seen her grow from a college student to newlywed to a mom of two littles and now a mompreneur! I was super excited to team up with Lauren for a pop up event at The DIME Store yet Lauren was hesitant wanting to be sure that it supported our mission, I assured her that in the story of every maker is inspiration from the books we read as children! DIME is teaming up with Book Scout for Wassail weekend fun, and wanted you to have a chance to get to know this passionate mom and hear the story behind Book Scout, so read along! Join Book Scout for a family Story Time at The DIME Store on December 1st at 5pm, we will be serving milk + cookies and wassail of course! Get all the details here and make your plans to park and start your Wassail/Holiday Tree lighting at DIME and then plan to come back on Saturday 10-2 to load up on books and handmade gifts. What is your Denton story? I am from Denton and was actually born at Flow Hospital before it was torn down (my tiny claim to fame). I went to school in West Texas and travelled a bit after college but always felt compelled to move back to this place. It’s been incredible to see the community’s growth in recent years, like I couldn’t have dreamt what Denton has become. I simultaneously feel a sense of pride in that reality and also small pangs of sadness thinking about the sleepy college town I grew up in. Tell us about your inspiration for Book Scout and how did this all get started? Book Scout is an independent pop-up shop of custom children’s books, and my daughter Scout is the muse behind our operation. I’ve always collected books for Scout, even before she was born, and loved the idea of curating a library that would carry my girl through her childhood. After receiving multiple inquires about the books in Scout’s library, I began to wonder if other families in the community might benefit from a bookseller that felt a little more personal than a box bookstore or the Internet. Since that time, Book Scout has been an idea rolling around in my head that is now finally coming to fruition. We’ve had some of our first events this fall and couldn’t be more pleased by the support and encouragement we’ve received from the community. Currently, we’re learning the most effective ways to get books in the hands of young readers and are excited about the next steps. What are your dreams for Book Scout? A huge dream for Book Scout is to have a storefront, from which to sell books, host literary events and add to the local flavor of the community. Denton used to have a wonderful children’s bookstore, Children’s Book Express, and I would love to be a part of revitalizing the experience of reading and buying books from a local children’s bookshop. I find myself sometimes peeking in the windows of stores for rent downtown, sighing nostalgically and channeling my inner Kathleen Kelly… someday. On a lesser scale, Book Scout is currently working to improve its online presence and hopes to offer a few new services in the coming year, including book subscriptions and what we call “library bundles”. Customers will be able to go to our website, provide specific information about their family and Book Scout will curate a library tailored especially for them. Tell us about the books that Book Scout offers? which is your favorite, or more importantly which are your children's favorites? Book Scout sells modern children’s books, and we hope to introduce readers to some new titles. We care about the book itself, how it feels in your hands and the quality of the paper used. Additionally, we feel strongly about captivating illustrations and clever, thoughtful writing. You will always find a Jon Klassen book on our shelves, and Andrea Beaty and David Roberts’ books are some of our best sellers. Currently, Scout and I are loving Rapunzel and Little Red by Bethan Woollvin. The black and white graphics with intentional pops of color somehow feel modern and retro all at once, and we love her cunning heroines. My 17 month-old son Collier has been slower to the reading game but just in the past few weeks has been requesting Brendan Wenzel’s They All Saw A Cat. We read it over and over again - I love watching the world of books begin to open to him. Any book illustrated by Eric Carle would rank among my favorites. Speaking of Children’s Book Express, they hosted a book signing with Eric Carle where I had the opportunity to meet him as a child. I have a signed copy of The Very Hungry Caterpillar that I now read with my children, which feels a bit surreal. His bold use of color and negative white space has largely affected my own aesthetic, and his illustrations always feel new, no matter how many times I’ve read his books. Also, my inner five-year old loves The Berenstain Bears; I’ll always have a sweet spot for those loveable bears. What books will you be featuring at the DIME pop up? Oh, I want so badly to give you all the titles we will be selling at the DIME event (I’m a horrible secret keeper), but we would much rather families come discover and interact with the books for themselves. We hope for customers to be swept up in the activity of reading, to rediscover the childlike joy that comes from a good picture book. I can say that we will have books for toddlers as well as elementary-aged students. We will have a selection of whimsical, rhyming books, as well as books that deal with heavier issues like grief. In addition to our regular collection, we will have a selection of Christmas books for sale, all of which have been published in last year. Simply put, we believe we have the right book for every child and look forward to helping families find the ones that are best suited for them. For our September First Friday make & take craft, we're making macrame plant hangers! If you're not able to make it to the DIME Store to make one using our craft supplies, follow these steps to make one at home! Invite your friends, or your mom, or your neighbor you've been wanting to get to know better, and make a night of it! The finished product will hold a small potted plant (2.5" x 2.5" pot) and be about 2ft long. 1. Gather all 8 strings into a strand, and about 5" from the top, loop over, as shown in Step 1. 2. 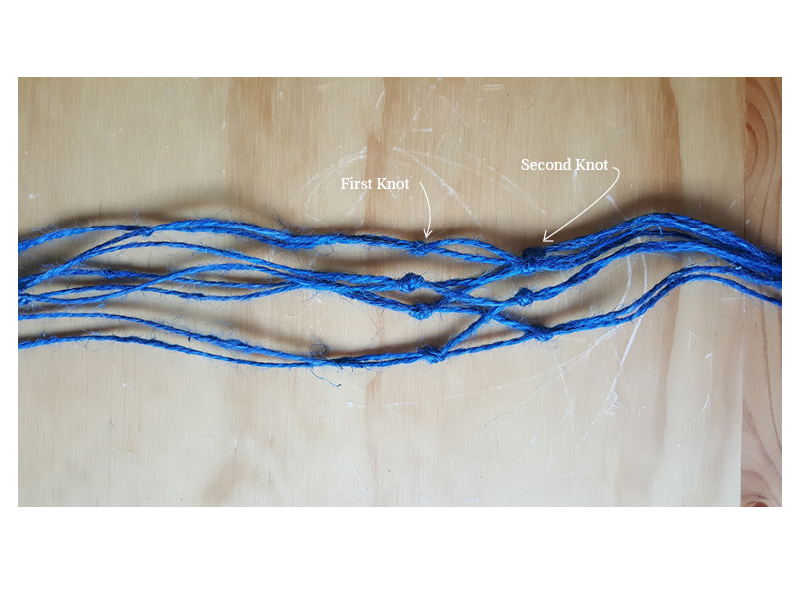 Wrap the strand as shown in Step 2. 3. Bringing the "tail" towards you, insert it down into the loop you created in steps 1 and 2. See arrow illustration in Step 3 for guidance. 4. Pull taut, to create a tight knot. Trim the ends to your liking. 1. Separate your 8 strings into 4 groups of 2. 2. About 1 ft down from the top loop, knot the 2 strings in a group together. Repeat this for each group of 2. For this project, we used your standard everyday knot, nothing fancy. If you want to get extra fancy, look up "square knot" and use that instead! 1. Using the picture above as your guide, group string B (from strand 1) and string C (from strand 2) together. 2. About 2" below the first knot you made, make your second knot, knotting strings B and C.
Your macrame hanger should be looking like this, right about now. How's it going? 1. 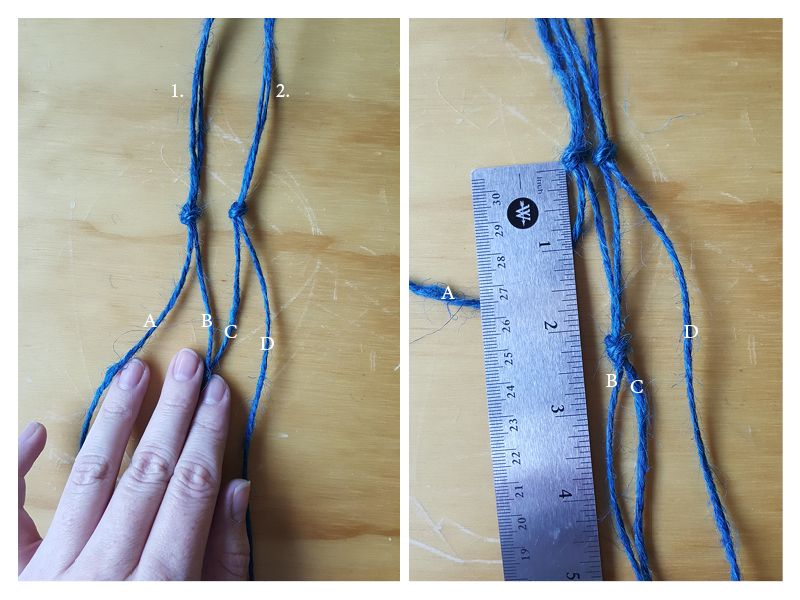 Line up your second knots with the bottom edge of your small (empty) pot, as best you can. 2. At approximately the spot where all your strands met at the drainage hole of the pot, join them together in one giant knot. Tip: When you're making the bottom knot, leave it loose at first. Chances are, it won't be perfect the first time and you'll want to be able to undo your knot and tie it higher/lower, or reposition your strands to match up better! 3. Set your empty pot inside to check it's placement. If it seems crooked, like it's tilting to one side, undo your bottom knot, and re-tie it making sure all your strands are even with eachother. 4. Trim those bottom pieces to suit your style, and you're done with the macrame part! 1. Putting gravel at the bottom of pots for drainage is really up to you. It's widely believed to aid in drainage, but there's evidence that gravel just fills space, and doesn't aid in... well, anything. No one at the DIME Store is a master gardener, so we encourage you to choose the option you think is best. 2. Gravel or no gravel, you'll want to fill up your pot about halfway with soil before you put your plant in. Then fill it up the rest of way with soil, taking care to cover all the roots. The plant we used is commonly known as an airplane plant. It can get quite large, so it'll need to be re-potted at some point. 3. Give your new plant baby a drink of water, and once it's not dripping from the bottom, set it into your macrame plant hanger! Thanks for following along! We hope you have fun with this DIY craft! Tag us (@dimehandmade) or hashtag (#dimediy) so we can see your beautiful projects! DIME Store since the very beginning, and her business has flourished like no other. She's constantly planning, researching, and creating. She's undoubtedly one of the most inspirational, encouraging ladies we've ever met, and we're thrilled she gave us this interview! Let's get to it! 1. Tell us about what you do. How did Savvie Studio get its start? Savvie Studio is a home goods + accessories brand based out of Denton, Texas. I primarily focus on home goods and gifts that celebrate life, nature, and the spaces that we share with those that we love. Savvie Studio started in 2013, shortly after The Dime Store opened. I had just taken a digital fabrication class at UNT (laser cutting, 3D printing, etc.) and was so inspired by everything happening within the creative community of Denton. I decided to invest my entire savings into a laser cutter and turn my small college apartment bedroom into a full blown laser cutting studio. The rest is history from there! 2. We've noticed a lot of your new products are plant-themed. What drew you to include air plants in your work? Do you have any tips for plant care? 3. What was one of the biggest difficulties you encountered when starting out? Savvie Studio started while I was still in college and working a handful of part time jobs. I poured every spare moment into getting this business off the ground, and was even late to my own college graduation because I was using my only day off to fulfill Etsy orders! Looking back on the beginning days of working multiple jobs at a time, and filling orders through the wee hours of the night, makes me so grateful that I can now call this my full time job. 4. How do you stay inspired? For my own creative practice, I crave time for silence and solitude (even it it has to happen after the rest of the world is asleep). Time where you promise yourself that you won't turn on a TV, or check your phone. Nothing is streaming and no one is going to interrupt your thought process. In that time I like to explore my instinctive tugs and let my mind wander. I let my instincts take over and find inspiration in where ever my mind goes. I also seek inspiration in the everyday tasks of life. I'm a huge believer in listening to those tiny little tugs on your heart -- those things that make you double take or smile. It could be a pattern on a fallen leaf, a styled home in a magazine, or a crazy color combination on a book cover at the library. I'm constantly photographing or jotting down those points of inspiration. I feel that those tiny moments are the way that the world is quietly telling you your next step. My goals have evolved over the years, but one thing remains the same: to live a creative life that can somehow inspire others to follow their own fulfilling path. That would be worth its weight in gold to me. 6. What advice would you give to emerging creative entrepreneurs? If you want to live a creative life, start now. While striving for perfection is great, waiting for perfection is detrimental. You may cringe at your stumbles, but that is only a sign of progress, not weakness. There is so much value in the mistakes you make along the way as you find your voice and create your brand or body of work. Don't let the technicalities of running a business hold you back. The business side of things doesn't come naturally to most creatives, but there are so many resources out there to help. Don't be afraid to hire a CPA, or admit what you do not know. Others want to help you, sometimes you just need to ask. For every dollar you spend, invest two dollars back into creative growth. Make friends and learn from their experiences, pick the minds of folks in different fields and various walks of life, and make sure you are okay with breaking a few rules before you pursue a creative career. You will be paving your own path, it will rarely be easy, and the day to day will never look like it does on Instagram, but it will be so worth it. Right now, the DIME Store is run by 3 hardworking ladies, and a co-op of 10 amazing makers. We're going to use this first blog post (first ever! Exciting!) to introduce you to the 3 women who run the store. They make sure the store is styled well, do the social media posts, keep the website up and running, plan all the events, and really just make sure that the store is offering as much as it can to our wonderful community. Shelley is the store's owner, and she's where the buck stops. She's also the biggest ambassador the store has, because she can't go 10 minutes outside of her house without running into a dear friend. Her heart is so big, she can't help but make friends everywhere she goes. Shawna is the store manager, and go-to girl for anything that needs organizing. She's also one our brightest rays of sunshine at the store, with her seriously contagious laugh. Allie is our assistant manager and workshop coordinator. She's amazing at keeping the team on task, and making sure meetings are as productive as possible. She's also one of the most encouraging people you'll ever meet. Shelley: " I make a line of cozy things for home and heart under the brand name Home Again, Home Again—pillows, tea towels, fabric covered journals, and a collaborative line of appliquéd tees and bibs for wee ones. Currently my line is exclusive to The DIME Store, but I hope to branch out to other stores in the next year." Shawna: "I make mostly greeting cards, but I also design enamel pins, totes, car decals and magnets through my aptly-named business, Shawna Smyth Studio. Super creative, right? 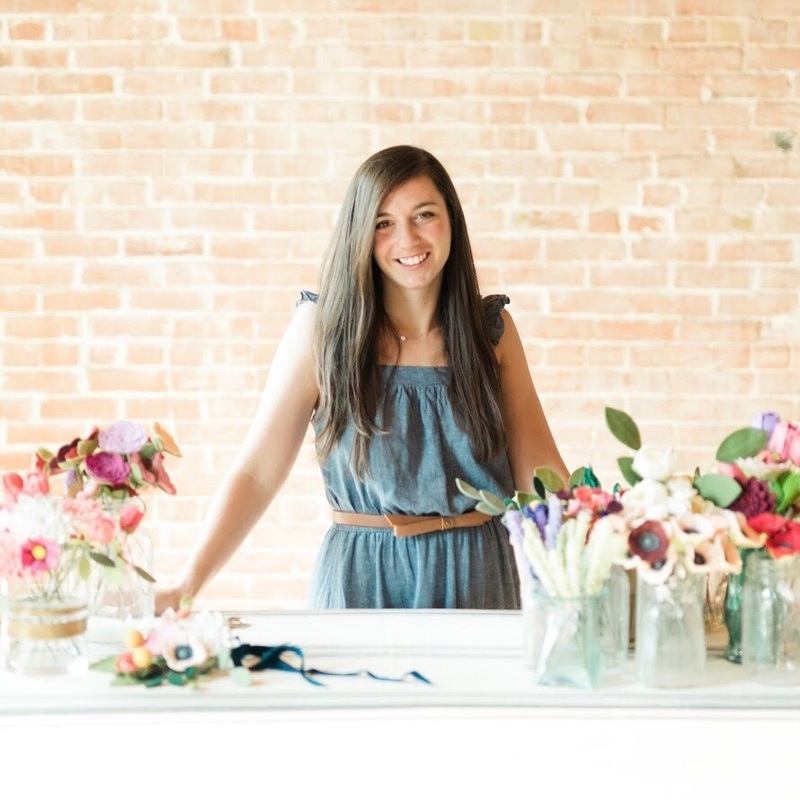 I make my products inmy home studio in Denton, TX and currently have products in 4 stores in Austin, Denton, and Savannah, GA."
Allie: "I have a brand of hand stitched paper goods, deskware, and original pieces under my own name, Allie Biddle. I make in my little house studio right here in Denton, Texas and sell in 14 shops across the country (so bananas)!" What drew you to make your current products? Shelley: "I have always been inspired by home and things that are cozy. As a kid I was 'designing' by looking through catalogues over and over to create imaginary cozy homes. My childhood experiences are a great inspiration for my work, they are a way to tie me to the people and memories that I hold dear." Shawna: "I think there's something magical and deeply personal in a handwritten sentiment. My cards are designed to be shared, and I love knowing that I'm helping friends share a laugh, or helping someone brighten a loved one's day. There's nothing better than knowing you're encouraging kindness." Allie: "My mom and grandmother definitely have indirectly inspired me to make greeting cards. My mom is someone who never gives a gift without a card, while my grandmother loved cards that she was gifted, but would throw them away as she did 'not have the room'. The memories of both of them made me want to make cards that were memorable, thoughtful, and intended to be saved." What was one of the biggest difficulties you encountered when starting out? Shelley: "When I first started out I was doing a lot more furniture design as a collaboration with my multi-talented husband and I loved it, but he was not loving it as much as me, and wanted to do more in his construction business. It was hard to redirect my passion for making cozy things for home, but I decided to brush up on my sewing skills and design soft and cozy things. My inspiration was the same, but my tools were different." Shawna: "Fear of the unknown, by far. I'm the first person in my family who's started a business from scratch. It's incredibly scary not knowing how to deal with taxes or business licenses, how to market your products, or even what kind of packaging to use. I didn't have a mentor readily available to help me navigate the unknown, until I 'infiltrated' the DIME Store. Haha! I used to hang out at the store for hours, asking questions, and would ask the girls working there if they'd be up for coffee and shop talk. Surrounding myself with these creative business owners really helped put my mind at ease, and gave me the confidence to persist." Allie: "Honestly, I think it's so hard to not compare yourself to other artists and small batch makers in the beginning! You see what's working for them and then just try to go in that direction because it might be 'successful'. But the truth is, no one can do what YOU can. So, I think exploring my own voice was a really fun and right direction. It led me to make products I really care about and have fun designing." Shelley: "Travel is a big inspiration for me, I think it is the slowed pace and the soaking up of the sights and beauty of the places that I have opportunity to travel. I am also inspired by reading and prayer—again the practice of slowing down so that there is head space for inspiration." Shawna: "So many ways! I think my biggest ideas come from having meet-ups with other creative business owners. Savannah, of Savvie Studio, and I have fairly regular 'Goals Meetings' and I always leave those feeling super inspired and refreshed. When I can't meet up with people in real life, I read blogs (Design Sponge, Paper+Craft Pantry, & Thimblepress are all amazing), or watch interviews/timelapses of artists I love on YouTube." Allie: "Oh my god, anyone who knows me knows I love a good nap. I get a lot of 'dreamy' ideas! But I also find a lot in journaling daily and in my personal yoga practice. I know something I'm thinking or feeling has got to resonate with someone else, and that connection is a huge inspiration to have everyday!" Shelley: "It looks like creating something intangible through the tangible. Using the God-given skills, gifts, and passions to create something that will outlive me—a creative legacy of sorts." Shawna: "Being able to support myself and my family, and being a good role model in general. I feel like I'm well on my way, but there's a lot of hard work to be done. As long as I can be consistent, and stay focused, I'm sure I can get there." Allie: "Being able to write a consistent paycheck to myself was super exciting but took what felt like forevvvvvver! It's a beautiful thing to do what you love and make a living doing it." What advice would you give to emerging creative entrepreneurs? Shelley: "Do all that you can to stay fresh to your craft and your business, be wary in comparison. Be uniquely you—perfectly imperfect!" 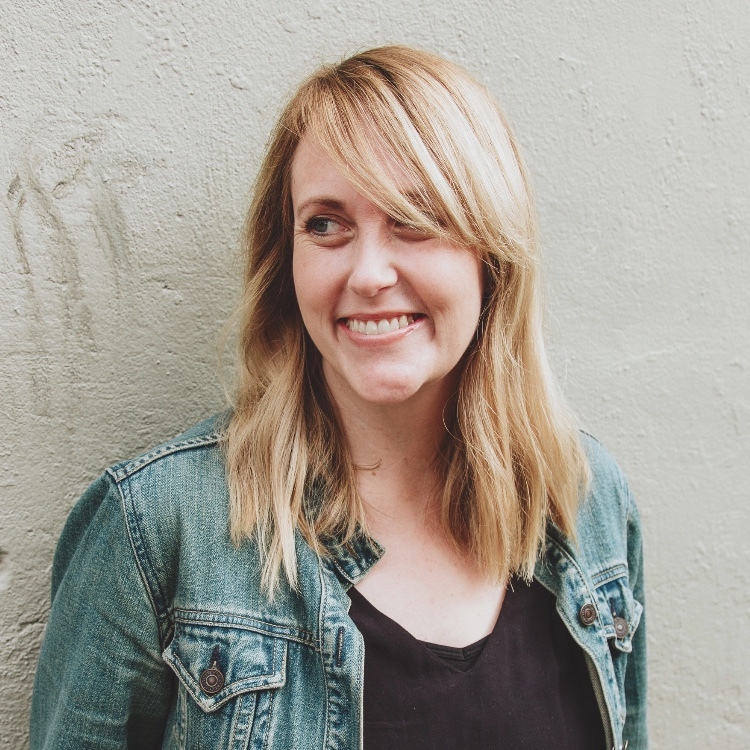 Shawna: "Introduce yourself to fellow creative entrepreneurs! Introducing myself to Shelley, and to Savannah (in particular) were seriously a couple of the most cringe-worthy experiences of my life, but they've changed my life for the better. I was super awkward, and went over the conversations in my head over and over for days after (saying, omg why did I say it like THAT? I must have sounded so dumb!) but if I had never introduced myself... I'm not sure that my business would still exist today. The encouragement, and advice I've gotten along the way has proven invaluable." Allie: "Explore your own voice! You'll learn to make work that you're proud of and that resonates with how you see the world. Once you start finding that, your audience will come to you. After all, at the end of the day, you're probably the only one putting in the hours making, designing, marketing, and selling. Might as well be for something that YOU like!" If you have suggestions for blog posts you'd like to see in the future, leave them in a comment below!